Samsung has historically been an exceptionally close partner of Microsoft, with strategic collaborations ranging from patent payments (for Linux) to Windows pre-loads and from DRM to hardware (Samsung’s core business, where it is an international leader). Samsung and Microsoft have historically been so conjoined a pair that their relationship would be one that even the NSA would envy. It is essential to remember that Samsung was the first electronics company to offer Microsoft payments for Linux-related software it never bothered to even specify (LG, another Korean giant, soon followed suit). Samsung was the first electronics-centric company (Novell being the first on the software side) that we called for a boycott against. 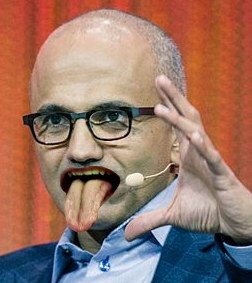 All this may be about to change as Microsoft’s hostility towards Android goes up a notch, despite attempts to paint the company “friend of FOSS” with the new CEO appointment (there has been no change in policy). Samsung is already challenging Apple's legal assaults on Android using the SCOTUS ruling on "abstract" patents. Soon it may have to do the same to Microsoft, which has just declared war on Android from two fronts. As this heads into the courtroom we will need to support Samsung, not chastise it. It’s an alliance of convenience amongst Android supporters. Google should join this lawsuit, offering financial support, evidence, patents, etc. Samsung is a big target when it comes to Android and Google cannot afford to let this case be lost, especially not from a moral point of view. Google previously supported other such companies (besieged by patent lawsuits), including HTC. Better yet, Google should serve the antitrust authorities and the anti-cartel authorities in multiple countries, informing them of the extortion tactics Microsoft has been using (the lawsuit means that Samsung refused to buckle in the face of extortion). There are two bits of news we wish to present today, sharing them among those who have not seen or heard those. The first is the antitrust lobby, which Microsoft invoked by proxy (Nokia is a European company, which makes it a convenient tool for pursuing antitrust action in Europe). Top European regulators have already warned Nokia regarding patents, so Nokia (acting as a Microsoft satellite) tried a competitive angle instead. Microsoft cannot do this without proxy due to hypocrisy. Having high market share is possible owing to technical merit. As the platform is Free software nothing prevents rivals and partners from stripping and adding other software. Just look at what Microsoft/Nokia did with Android. This whole case is bogus, but it was brought forth by Microsoft and its proxies. It’s an attempt to use regulators to tilt the market against Free software, using bizarre logic and a pretense of collective anger. Microsoft is seeking a ruling as to whether its acquisition of Nokia’s handset and services business negates its intellectual-property licensing agreement with Samsung that dates back to 2011. Microsoft also is seeking unpaid interest from Samsung, resulting from the period of time last year when Samsung withheld patent royalties from Microsoft — royalties which Samsung later paid. This all can be traced back to one single ‘analyst’ whom the Microsoft lobbyists kept quoting, repeating the claim without any substantial proof and flooding the media with it. We routinely showed that this is all speculation, but a speculation that grew feet very quickly and stuck in people’s minds. Samsung never said how much (if anything) it had paid Microsoft. We only knew that they had some patent agreement, most likely on FAT. Samsung has a vast trove of patents, so it might be more like a cross-licensing agreement. We just don’t know. Microsoft at one stage said that it sought $15 per phone from Samsung, but it never got its way (Apple sought about $50 per phone and ended up getting less than $1 from each). As ZDNet is somewhat of a zoo of Microsoft ads and Microsoft boosters with direct Microsoft connections, salaries past and present, and even bribes like laptops, we probably should not entertain the commenters too much (some are terrible comments of low quality and poor grammar, but some are better). One comment further down says: “It’s just a veiled threat they’ve been using and getting away with for years. “Somebody needs to stand up and let the entire world know that the largest patent troll in the world is the one that makes the worst OS in history and is headquartered in Redmond. “I sincerely hope Samsung follows through, and doesn’t let this bully steal their lunch money! These massive layoffs are a symptom of what Microsoft is going through. Well, based on the latest numbers , Microsoft’s sales in the mobile domain are negligible and don’t even make the latest count’s threshold.